The first lady whose beautification work in the nation’s capital is in bloom today will be honored at the United States Botanic Garden in a free summer exhibit created by the Lady Bird Johnson Wildflower Center at The University of Texas at Austin. “A Clear Vision” will run May 24 through Oct. 13, and is the first exhibit at the Washington D.C. garden’s recently completed First Ladies Water Garden. The Lady Bird Johnson exhibit will be part of the Botanic Garden’s Summer 2008 exhibit, “One Planet — Ours!,” focused on sustainable approaches to living. This exhibit near the U.S. Capitol grounds is expected to draw 300,000 visitors. Johnson, who died July 11, 2007 at age 94, was a visionary and an environmental leader ahead of her time. She expressed her passion for native landscapes through beautification programs in Washington, D.C. and elsewhere, and through her campaign for the Beautification Act of 1965 that brought wildflowers and fewer billboards to national highways. She shared her environmental ethic more broadly when, at age 70, she helped open the Wildflower Center in Austin that studies and educates others about native plant conservation and sustainable use. The exhibit will also feature her pictures and quotes on signage on low walls that surround the courtyard-like garden. And Johnson’s words will float on steel spirals in the water of the granite and bluestone fountain that anchors the First Ladies Water Garden. To complement mid-Atlantic native plants that the U.S. Botanic Garden displays, “A Clear Vision” will include container displays of native plants from across the country. The pots will hold plant stakes directing visitors to obtain wildflower seeds packets and educational information at the Botanic Garden’s Conservatory. Exhibit messages about the value of native plants appear in unexpected, whimsical ways – on the underside of umbrellas that cover four seating areas, and on stakes in the native plant pots. These messages will describe how native plants conserve water and require fewer chemicals and less maintenance. These native plant features reduce the need for gasoline-powered mowers and blowers, and for fertilizers, herbicides and pesticides. 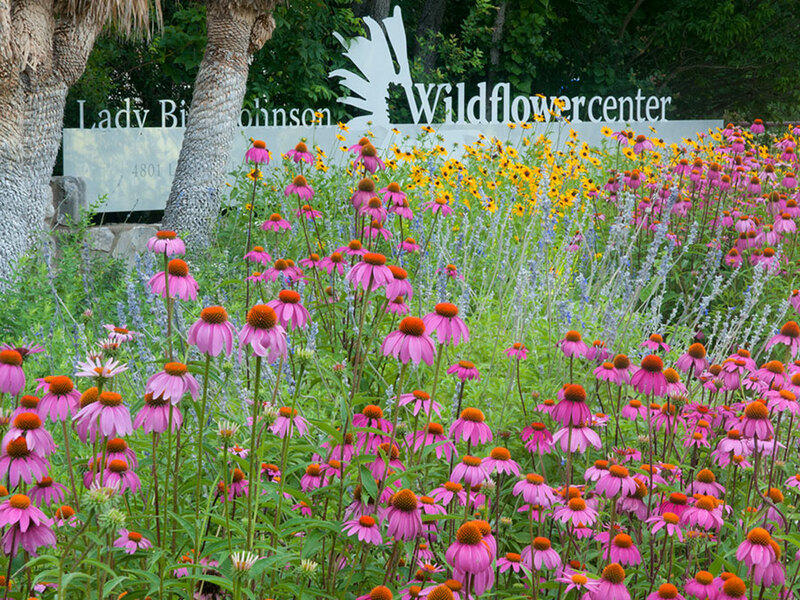 The Lady Bird Johnson Wildflower Center is also a founding partner with the Botanic Garden and the American Association of Landscape Architects in the Sustainable Sites Initiative. This effort described in the exhibit will create voluntary guidelines and a rating system by 2009 for sustainable landscape design. “A Clear Vision,” designed by Leslie Ernst of The University of Texas at Austin Office of Public Affairs, is funded partly by a grant from university President William Powers Jr. The regional native plant displays were developed by horticultural staff led by Andrea DeLong-Amaya, the Wildflower Center’s horticulture director. Others participating in the Botanic Garden’s summer exhibit include the United Nations Environment Programme (UNEP), U.S. Department of Energy, American Horticultural Society, U.S. Environmental Protection Agency, Longwood Gardens and the National Wildlife Federation. The exhibits include “Cool Globes,” with more than 40 sculptures depicting solutions to the problems of living unsustainably. The Botanic Garden’s Conservatory and National Garden, which contains the First Ladies Water Garden, are open to the public, free of charge. The National Garden is open every day through Sept. 30 from 10 a.m. to 7 p.m., and from 10 a.m. to 5 p.m. beginning in October. The Conservatory is at 100 Maryland Ave. S.W., on the west side of the U.S. Capitol. Information is available by visiting http://www.usbg.gov/. 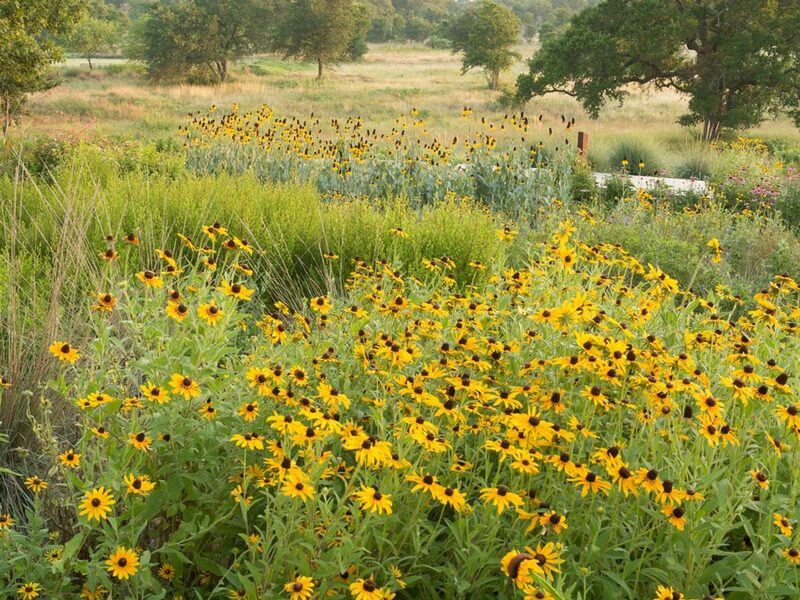 Information about the Lady Bird Johnson Wildflower Center is at https://www.wildflower.org.